Juventus were "taking too many thing for granted" early in the season before winning 10 Serie A games in a row to go second, boss Massimiliano Allegri said. The Turin side, who are chasing their fifth consecutive title, beat Udinese 4-0 on Sunday to move within two points of leaders Napoli. They were 12th, 11 points off top, when they lost 2-1 to Sassuolo on 28 October - the last time they failed to win. 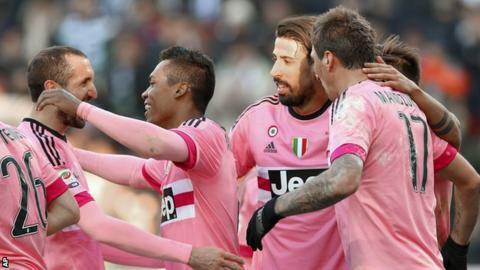 "The players were not playing at the level they are now," Allegri said. "I was without Claudio Marchisio and Sami Khedira, Mario Mandzukic had injury problems during the first two months. "After last term's efforts, there was always a risk of needing some time to reach peak condition for the current campaign. "There were also some unfortunate incidents, for example the draw with Frosinone, when we conceded from their only corner kick. It was, however, almost predictable that such things occurred in that period, as we were all taking too many things for granted."